The Oxford Catholic Young Professionals (OxCYP) held their first meeting of 2011 in the parish centre yesterday evening with a fascinating talk from Br Lawrence Lew O.P. on the devil. The main point was that Satan (the accuser) is still very much alive and kicking but delights in the fact that people have tended to forget him. His greatest victory is that people do not believe he exists. Whereas the world and the flesh tempt us by attraction, the devil tempts us by persuasion. He acts on us by persuading us that something is good and to be desired when in fact it is not. We must use our reason – purified and strengthened by God's grace – to surmount such temptations in order not to surrender to our passions. 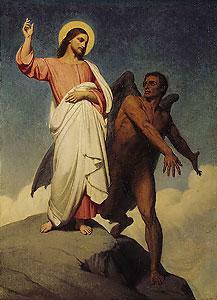 Satan, then, is never the direct cause of our sin, only the tempter. We sin because we choose to. In order to combat such temptations we must make use of the tools God has given us: the sacraments, the intercession of Our Lady and the saints, as well as the weapons of prayer, fasting and almsgiving which are the three mainstays of our Lenten practice. In particular, denying ourselves things which in themselves are morally neutral or even good helps us to overcome our desire for the things of this world so that we can become more firmly attached to God and the things of God instead. In the end, the chief weapon in our battle against the one whom Our Lord called, "a liar and the father of lies" (Jn 8:44) is obedience to the will of God in all things. Why so? Because it is the evil will of Satan to sow rebellion and disobedience to God just as he did in the Garden of Eden. Satan does not care whether we believe he exists; he only cares that we rebel against God's holy will. After the talk and a discussion we went into the Sacred Heart chapel for Compline before adjourning to the local pub for a pint and more discussion. OxCYP (a group for people in their 20s and 30s) will meet in the parish centre here at the Oratory at 8pm every first Wednesday of the month from now on. Please join us.